How do I control slugs? It is a question so many gardeners ask year after year. 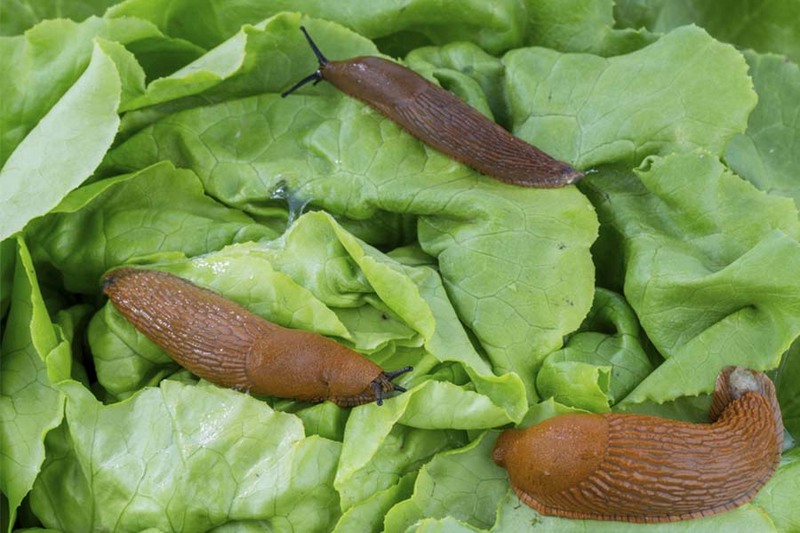 Slugs can cause some serious damage to home gardens and flowerbeds. For starters, they can wipe out an entire row of young seedlings in a single night. They also can chew holes in everything from hosta, to tulips, greens, and tender, young vegetable plants. Anyone who has ever had to deal with the slimy, slithering creatures knows just how much harm they can cause. Adding to the problem, they do almost all of their damage out of sight in the cover of the darkness. Slugs are night-shift workers, coming out in the wet, moist and cooler temperature that are suited perfectly to By day, they hide under leaves, in the soil and anywhere they can stay cool, wet and moist. Slugs are most active in the spring and fall, when the cool and often wet conditions help them thrive. But the real question is, how can you keep slugs from ruining your garden? Well, today, we get a little advice from Nancy Starner. Nancy tells how she has kept the little creatures at bay with a three-pronged organic approach. Here in Pennsylvania, slugs can be a real problem. Especially in the early spring, when the wet and damp rains make it ideal for them. It seems like as soon as we start planting, they come out to enjoy it. I like to keep my garden as organic as possible, so I have never wanted to spray or put down slug and snail bait. I guess you can never totally eliminate them, but I have found a few things that seem to work. They have really helped me control slugs from destroying my young plants. I hope they can help you too. Before I do anything drastic, I start by going on what my husband calls “Slug Patrol”. At the first sign of damage, I head to the garden in the early evening and morning to hand pick them off the plants. I walk up and down with a little can filled with soap and water and brush them into it. It seems so basic, but it really does a great job of controlling them for causing too much damage. Next, I protect my most tender plants. For vegetable plants like my cucumbers and peppers, I protect them when they are just young seedlings with toilet paper rolls, egg shells and coffee grounds. I cut the toilet paper rolls (or paper towel rolls) in sections about 2″ high. Then, I slit the roll and slide it like a collar around each plant. Next, I sprinkle crushed egg shells or spent coffee grounds right around the collar. It works like a charm! The slugs have a hard time making it over the rough edges of the coffee grounds and egg shells. The sharp edges slice into their skin. The collar makes it really hard for them to make their way to the plant. The coffee grounds also act as a great natural fertilizer. For my third and last trick, I use natural bait traps that attract the ones left. Good ol’ fashioned beer traps really do work. You can use a small container filled about halfway up with beer. Tuna cans or small plastic bowls work well. The slugs that are still around seem to love it. They jump right in. A friend of mine told me a few years back about the melon, orange or grapefruit rind trick. Just place a few rinds in the rows and you will be amazed how many you will have collected by the morning. It does not kill them, but will attract them away from your plants and you can then get rid of them. Thanks so much Nancy for the slug tips! Do you have a garden tip you would like to share on This Is My Garden? How about sharing your tips with fellow gardeners on growing your favorite flowers, shrubs, trees, vegetables and more! I have two different methods to control slugs. I sieve mature compost through a 1/4″ screen, then just as my seeds are about to emerge, I spread a half inch thick layer on the seed row. My biggest problem is with baby beans. The slugs smell lunch, head across the compost and are immediately stuck in neutral. The compost dries out very quickly and as soon as they touch it, it sticks to their body and they can’t lay down a slime trail. They’re stuck. Out comes the sun, et voilà, escargots. Second way is DEADLY to every bug I’ve ever tried it on, including earwigs and army worms. Add one part household ammonia cleaner (it’s nitrogen) to nine parts water and spray away. I’ve never washed it off, and I’ve never burnt a plant. After I pick up the dead hosta leaves in the fall, I sometimes spray a heavy coat on the ground. It kills the eggs. You can do it again in the spring.